Royal Enfield motorcycles have been among the most preferred choices of the Indian biking aficionados. The Indian motorcycle company is a huge success in the global motorcycle markets as well, as the brand carries forward the legend of the original British Royal Enfield bikes from the long dissolved UK based company. The Royal Enfield motorcycles are primarily known for their great sturdy nature and vintage looks. Here we are comparing two such highly popular cruiser bikes from the house of Royal Enfield to consider their capabilities side by side. When looks are concerned, the Royal Enfield Classic 350 is an exactly identical to the Classic 500. There are no visually apparent differences between the two Classic models, apart from the color. The motorcycle comes with a bold retro styling and features body colored front fender fully covering its front tyre. The bike’s front forks add to its looks, while the chrome garnish on its multi-spoke rim enhances the premium look. It has aggressive tiger eye lamps and a standard circular headlight unit that makes it visually similar to the Bullet, but its small visor with chrome finish offers an individual touch. The Classic 350 also has the patent orange hued circular indicators and rear view mirrors with chrome finish. The bike’s fuel tank has a simple design with thigh rubber pads that accentuates the bike’s vintage looks. It offers two types options – solo rider seat and split seat for pillion rider. Its other features like body colored side panels, long silencer, full sized cowl, squared tail light, rear broad tyre and lots of chrome garnish all add to its premium good looks. 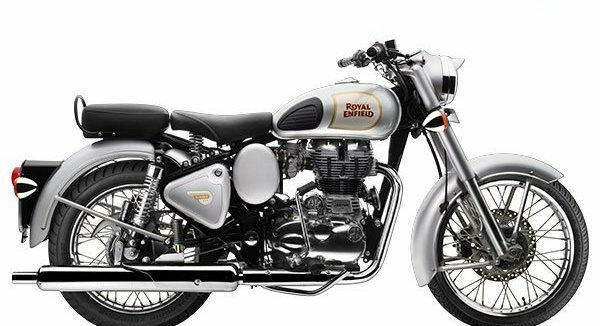 The Royal Enfield Bullet Standard 350 is known for its vintage look that is its greatest attraction. This motorcycle seems to reverse time and evoke nostalgia and looks like a machine right from the 60s. The Bullet 350 is a very sturdy and tough bike with its heavy metal structure. It flaunts a patent circular headlight console with pilot lamps on its sides. It misses a cowl and visor, and gets black round rear view mirrors placed on its handlebar. The bike flaunts large orange side indicators, muscular front forks with chromed garnish, mud guard fully covering its front wheel, full sized fuel tank with a classic design, body colored tool box – all of which simply add to its retro styling. It’s very long chrome finished silencer enhances its premium and beefy appeal, while its rear also gets simple tights and chrome finished rear fender to keep the simple yet premium looks uniform. The Bullet standard 350 also comes with a familiar seat design with a steel grab rail integrated at its back. Royal Enfield Classic 350 comes powered by a 4-stroke 346 cc air-cooled petrol engine that also powers the other similar bike models such as the Bullet and the Electra. This potent engine has the capability to pump out a max power output of 19.8 Bhp at 5250rpm along with a peak torque output of 28 Nm at 4000rpm. The Classic 350 comes equipped with a 5 speed manual transmission gearbox. The engine is highly reliable and offers great performance, although it is not a speed monger. The Classic 350 is a true cruiser bike that offers nice and relaxed highway cruising. The power packed performance of this bike comes slow and easy and can be a real pleasure for bikers. The superb refinement of the engine makes the bike really stable and vibration free, even when racing at a speed level of 100 km per hour. It offers smooth gear changes and has a top speed of around 125 km per hour. 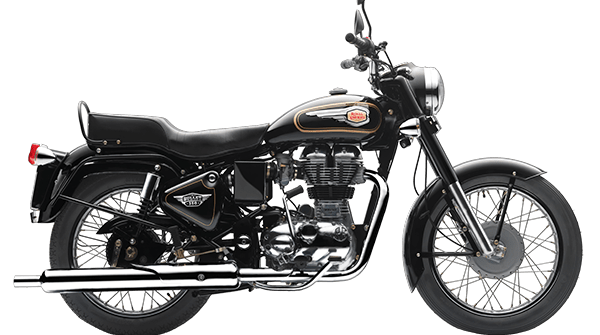 The Royal Enfield Classic 350 has the capability to offer a fuel efficiency of around from 30 Kmpl in the city, while managing a mileage of around 40 Kmpl on the highways. The Royal Enfield Bullet Standard 350, as mentioned above, comes packed with the same powertrain. It is powered by the same 4-stroke 346 cc petrol engine that is air-cooled and has the capability to generate 19.8 Bhp at 5250 rpm and 28 Nm at 4000 rpm, and comes paired with the same 5 speed manual transmission gearbox. Owing to the same engine and transmission, the Bullet also offers the same grounded power and reliable ride experience as the Classic 350. The Bullet remains very stable and planted even on high speed levels and offers a vibration free, enjoyable ride all through, while also being able to reach the mark of 100 Kmph from a standstill position in less than 16 seconds. The top speed of the bike remains identical to the Classic 350, which means around 125 kilometers per hour. Royal Enfield Bullet 350 is also capable of returning a mileage of around 25 to 30 kmpl on the city roads, while offering a better fuel efficiency of around 35 to 40 kmpl on the highway stretches. Royal Enfield Classic 350 comes equipped with a 35 mm telescopic front forks suspension system for the front and gas filled 5-step adjustable shock absorbers for the rear. The bike offers an effective braking system that comprises of twin piston caliper disc brake of 280 mm for the front wheel and potent 153 mm drum brake for the rear wheel. The Bullet on the other hand comes braced with a front telescopic forks suspension, while a gas filled swing arm shock absorbers suspension does the duty at the rear. The Bullet’s efficient braking system comprises of a 178 mm drum brake for both the front wheel and 153 mm drum brake for the rear wheel. Royal Enfield Classic 350 comes riding on a 19-inch front wheel 18-inch rear wheel. It comes in only one variant and offers 6 color choices of Ash, Lagoon, Mint, Chestnut, Classic Black and Classic Sliver. The Royal Enfield Bullet 350 is equipped with 19 inch spoke wheels. It is offered in a single variant in only Black color. 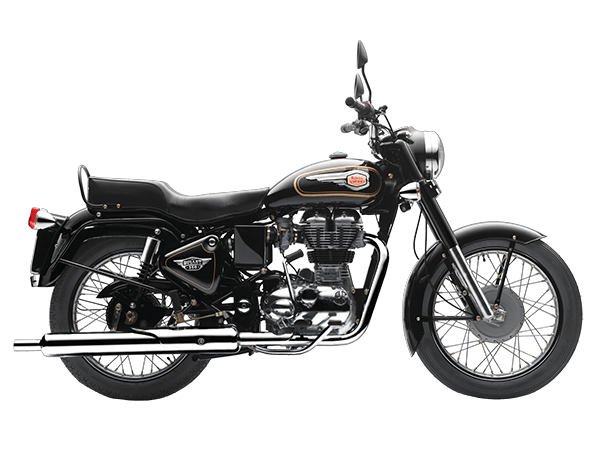 Royal Enfield Classic 350 is priced at around Rs. 1.29 lakhs, while the Bullet 350 Standard has been tagged at Rs. 1 lakh (both prices, ex-showroom, New Delhi).